Short music piece composed for AR.Drone 2.0 Parrot Quadricopter. It consists of the sound synthesis generated by Drone’s movement in the space as well as the sound of engines. When the tracker detects the drone flying in defined area it generates data, which is then interpreted using a pre-defined algorithm in an open source visual programming language Pure Data. 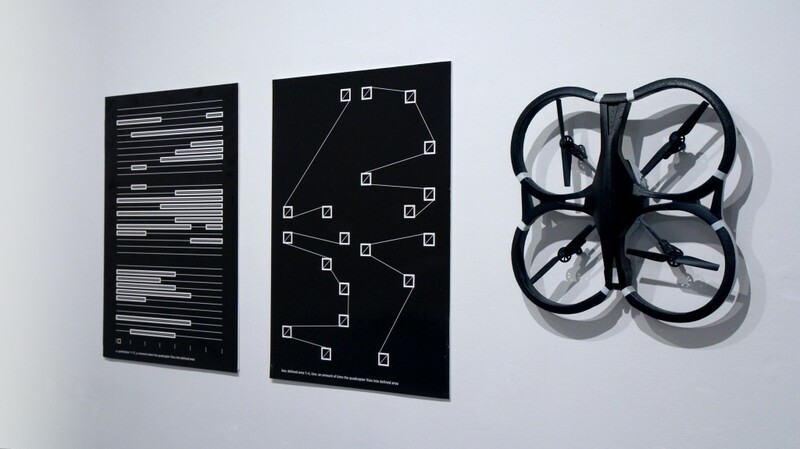 In this way the Drone shapes and structures musical material and becomes an instrument. Drone is controlled via FreeFlight application running on iPad. Depth image from Kinect sensor is evaluated by a patch in vvvv which detects the drone’s location in the space (more precisely its relative position inside the bounding-box). A vvvv is sending it to Pure Data, which are transmitting it to a music system. 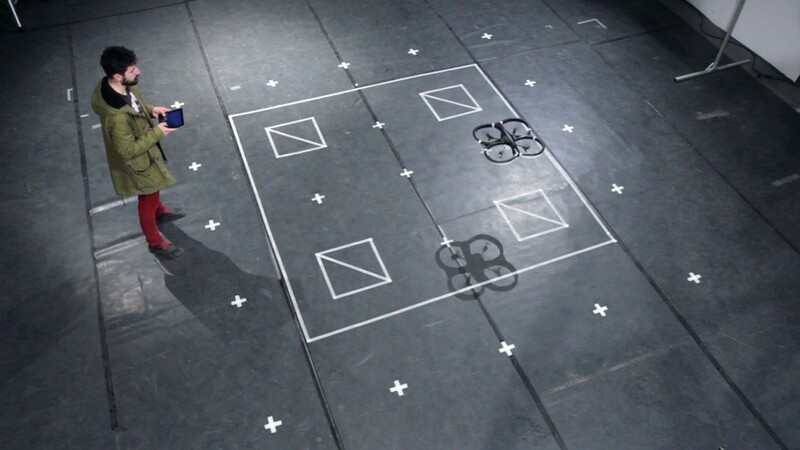 When a quadcopter flies into the defined area it generates musical pattern sequences based upon a predefined algorithm. In this way the drone takes control over the sound synthesis. Mária is a cross-disciplinary artist from Slovakia. She received a Bachelor’s of Digital Media at Academy of Arts. During her studies she was offered an internship at École de recherche graphique in Belgium, following that immediately with a working internship in CIANT — International Centre for Art and New Technologies. She is currently doing a Master at FAMU Center for Audiovisual studies in Prague, researching on a dance-tech and technologically informed dance practices, more precisely on the use of bio-sensors in the field of contemporary dance. She lately participated at Dutch Electronic Festival in Rotterdam, Cinedans festival in Amsterdam and Creative coding lab in Berlin. Andrej is an independent artist purposing technology in the fields of new media art, interactive design, physical computing and 3D printing. His work also maintains a strong fascination with the entanglement of nature and technology. He has developed many interactive installations and lectured on open source softwares, programming platforms VVVV and Arduino. He lately exhibited at Signal festival in Prague, 3D print show in New York and WRO festival in Wroclaw. In addition to his work he is actively involved in technological solutions for other Czech and foreign artists, for instance in installation for Expo Milano 2015.